Canopy Shores Park is a 33 acre site located within the St. Augustine Shores Planned Unit Development (PUD) located off US 1. Direct access to the site is provided off Shores Blvd. on to Christina Dr. and this site lies across the street from the St. Augustine Shores’s Riverview Club property. As the name implies, Canopy Shores Park is filled with majestic canopy oak trees defined by three distinct vegetative communities, the Hydric Hammock, Estuarine Tidal Marsh and the Floodplain Swamp. The Hydric Hammock vegetative community dominates the majority of this site (27 acres) consisting of dense, mature canopy of live oaks, laural oaks and red cedar containing an understory of yaupon holly and cabbage palm. Along the eastern portion the site lies ground cover material consisting of Spanish needles, American beauty berry and blackberry while the western area contains a dense cover of saw palmetto, sparkle berry, deer berry and wild petunia. 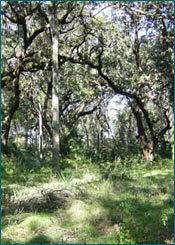 The Floodplain Swamp consisting of 3.5 acres lies adjacent to the man-made creek which bisects the site from the Matanzas River inland to the southwest. Along the southern creeks edge the floodplain swamp is filled with dense lizard trails, marsh pennywort, buttonbush, netted chain fern and wax myrtle. Estuarine Tidal Marsh vegetation lies along the Matanzas Rivers edge, consisting of 2.5 acres and is defined by the sea oxeye daisy, needle rush and cord grass. The majority of the wildlife species located on this site is located in the estuarine tidal marsh vegetation area and the species observed includes bald eagle, brown pelican, least tern, yellow crowned night heron, reddish egret, snowy egret, tri-colored heron and white ibis. Since Canopy Shores eastern boundary is defined by the Matanzas River it lies within a archaeologically high probability area and contains one shell midden (SJO3169) according to the master site file. Canopy Shores will be used as a resource based park and the proposed amenities include water front boardwalk, canoe/kayak launching area and dock for fishing and wildlife viewing (birds, manatees and bottle-nose dolphin) trail head, hiking trails and fitness trails, interpretative signage educating the visitors about the natural vegetation, wildlife and archaeological resources on this site, playground area and parking facilities. Because this project site is located on the Intracoastal Waterway, it is just another piece of a massive puzzle that interconnects federal, state and local initiatives to preserve, protect and maintain the natural resources (vegetative communities, wildlife habitat, improve water quality and protect shellfish harvesting areas) along the Intracoastal Waterway. The federal initiative is being pursued by the National Oceanic and Atmospheric Administration (NOAA) and this administered through the Department of Environmental Protection (DEP) in the implementation of the Guana, Tolomato, Matanzas (GTM) National Estuarine Research Reserve (NERR) Management Plan. Other State initiatives being pursued by DEP and the SJRWMD include the GTM Water Quality Task Force and Northern Coastal Basins Program, respectively. In addition Duval County’s Northeast Blueway Phase I – Pablo Creek CARL application approved by the ARC in 2000 as a Category A project and St. Johns County’s Northeast Blueway Phase II – Tolomato and Matanzas Rivers Florida Forever (FF) application was approved by ARC in 2001. This Florida Forever application will help protect the natural resources along the Intracoastal Waterway further. Through these programs and initiatives the federal, state and local agencies are coordinating to implement the mutual goal of preservation, protection and maintenance of the natural resources along the Intracoastal Waterway.